"Little Raptuko has been trembling since the big T-Rex came. Quick ! A bush to hide !" 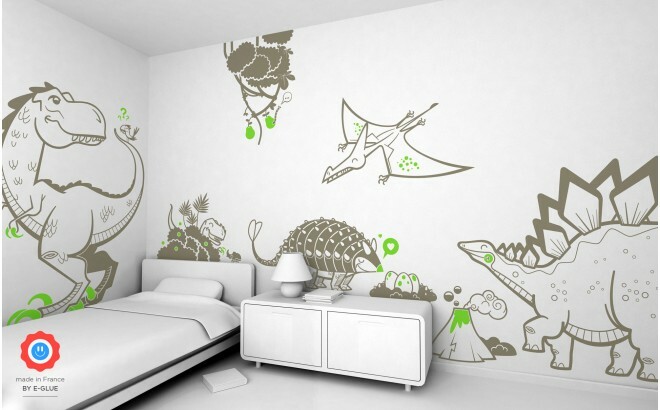 A dinosaur themed kids room guarantees your child’s happiness ! Create a real Jurassic Park with the large scale wall decals E-Glue and paste all your boy’s favorite dinosaurs on the walls of his room : wall stickers stegosaur, wall decals tyrannosaur, pterodactyl, ankylosaur, all have been designed by our design studio with different wall decor for a volcanic atmosphere ! Sold in full pack (8 wall decals : 1XXL+1XL+2L+4M), half-pack (4 wall decals : 1(X)XL+1L+2M) or as single pieces in our single decals category, all wall stickers E-Glue offers various color and customization options. Feel free to contact us for different color combinations (2 main colors and 2 accent colors without extra cost, for example) and/or use the comment box during checkout if you just want to invert a design. For that, please use the names indicated in our free downloadable color chart, as well as ones of the concerned wall decals. Moreover, do not hesitate to send us your address and favorite colors to get free samples. All E-Glue wall stickers and decals for kids are co-designed and handmade in our workshop from premium materials (source : France and Germany), therefore ensuring a great customer service and high quality finish from design to product then secure packaging to delivery. Our clean, clear and unique graphic designs have been created by specifically working on lines, curves and outline shapes to get both some volumes and a perfect balance as wall décor, avoid large flat areas, make easier the application, use a laser cutting process only and not printing solutions. No solvent, ink or other chemical is applied to the surface of our wall decals ; E-Glue can therefore guarantee a safe environment to kids. For example, see below a wall decal Ankylosaur (taupe and light green) applied on a light grey wall.